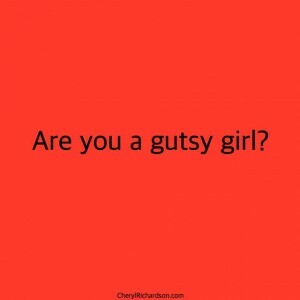 Week 16 – Why you need to be a gutsy girl. This morning, while out for a walk, I listened to a Tim Ferriss podcast interview with Caroline Paul, author of Gutsy Girl: Escapades for Your Life of Epic Adventure. Caroline was one of the first female firefighters in San Francisco and she’s led a pretty adventurous life doing everything from fighting fires to paragliding and scaling mountains. During their conversation, Caroline talked about how important it is to encourage young girls to take more risks. Studies show that from an early age, girls are told, “be careful because you might get hurt” while boys are encouraged to go for it. While Caroline doesn’t promote getting injured, she believes the decision to not do something because you might get hurt is a terrible reason to avoid taking risks. That caught my attention. I realized that even though I was now on the other side of life, I was being influenced by the same message. At times, when I was about to do something physically challenging, I worried about getting injured because of my age. Fortunately, I knew if I let that fear take root, it would turn into some kind of wild, invasive vine that wrapped itself around my life and slowly suffocated my aliveness. It’s one of the reasons I joined a Crossfit gym (you can read about that escapade here). Listening to the podcast got me thinking about being a gutsy girl. Most of the highlights of my life have been the direct result of brave choices – getting married, speaking in front of large audiences, leading the Lifestyle Makeover Series on The Oprah Winfrey Show, traveling around the world, publishing books, even rescuing our cat (after all, there’s no greater risk than to love with all your heart). Being a gutsy girl breathes life into life. By the time I finished my walk, I not only had a renewed appreciation for taking risks, I knew I wanted to put more deliberateness behind the idea. I’m now in the process of identifying the desires I hold at bay because I’m afraid, so I can do something about it. I’m also realizing that gutsy choices change with age. While scaling a mountain or flying an airplane might be in my future, I’m interested in other types of courageous acts, too. I want to be brave enough to be softer, more vulnerable. I want to be bold enough to say no to a great opportunity because it might knock my life out of balance. I want to be courageous enough to let go of control and let someone else lead for a while. How about you? What are you willing to be gutsier about? Or, what bold step have you taken lately that’s made a significant difference in your life? Hit reply and tell me about it. I’d love to be inspired by you! This week’s video shows a brave judge speaking truth to kids. You can watch it here.